DESCONGESTIONANTE DE LAS VÍAS NASALES CUANDO LA NARIZ ESTÁ TAPADA. 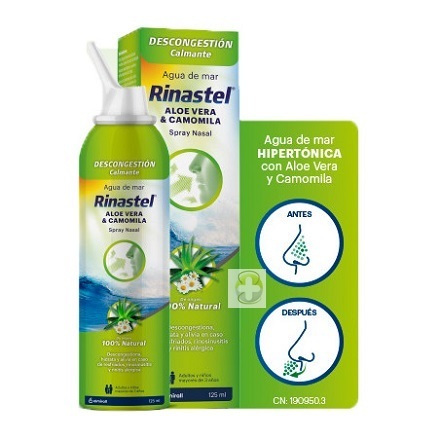 HIGIENE NASAL DIARIA EN ADULTOS Y NIÑOS MAYORES DE 3 AÑOS. MEJORA LOS SINTOMAS DE LA RINITIS ALÉRGICA Y ALIVIA LOS SÍNTOMAS DE RESFRIADOS EN COMBINACIÓN CON TRATAMIENTO ORL. HUMIDIFICA, CALMA Y SUAVIZA LA MUCOSA NASAL. SE PUEDE USAR CON SEGURIDAD A DIARIO E INLUSO VARIAS VECES AL DÍA SI FUESE NECESARIO Y, DURANTE UN PERIODO LARGO DE TIEMPO GRACIAS A SU COMPOSICIÓN NATURAL Y FISIOLÓGICA. 8. DESPUÈS DE CADA USO, SEPARAR EL APLICADOR DEL ENVASE Y LIMPIAR CON AGUA CALIENTE. AGUA DE MAR, AGUA PURIFICADA, EXTRACTOS ACUOSOS DE ALOE VERA, EXTRACTOS ACUOSOS DE CAMOMILA. PARA USO EN ADULTOS Y NIÑOS MAYORES DE 3 AÑOS. NO USAR EN CASO DE HIPERSENSIBILIDAD A CUALQUIERA DE LOS COMPONENTES. PUEDE EXPLOTAR SI SE CALIENTA. ALEJAR DEL FUEGO, CHISPAS, LLAMAS, SUPERFICIES CALIENTES. NO AGUJEREAR O QUEMAR, INCLUSO CON EL ENVASE VACIO. PROTEGER DE LA LUZ SOLAR. NO EXPONER A TEMPERATURAS QUE SOBREPASEN LOS 50ºc.